The Igbo heads above have been vetted as authentic. The heads below show no evidence of age or use and were probably made to be sold. 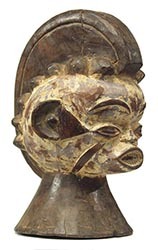 Most Igbo heads, those with wide flairing necks, were used or intended as headdresses. Numbers 1, 5, 7 and 17 were used or intended to be displayed differently.